Events and login bonuses to celebrate BloodWars’s twelfth birthday! Test servers and level recalculation! This year we’ll be celebrating the 12th birthday of Bloodwars. We’re happy that you’re with us and due to that, we would like to give you a series of celebrations starting on 1 August 2018! At the turn of August and September, we are going to launch test servers where you’ll be able to test upcoming changes in the game! 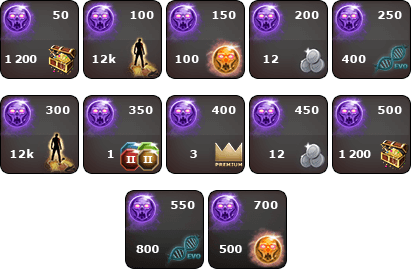 We’ve got 12 additional bonuses for you for BW’s 12th birthday! The bonuses will be available between 1 and 14 August 2018! On 1 and 12 August 2018, we’ll activate Souvernir Shop, and between 2 and 11 August 2018, Cain’s Holiday Vision DeLuxe will also be active (luck +50, 2x evolution points for ambushes, +50% chance for a rune during an expedition)! Charon is coming to the City! Charon is coming to the city as part of the birthday celebration! Between 1 and 12 August, he’ll be offering premium service packages at a discount. Remember to also visit his Lottery! 50x +1200 free FLD points! Days of premium for new players! We’ll give 12 free days of premium to every new account created between 1 and 12 August 2018. Test servers and level recalculation. At the turn of August and September, we’re going to launch test servers. You’ll be able to test level recalculation, new training costs and the balance of all other aspects of the game so that we can end the beta stage. The servers will be open for everyone – we would like as many people to participate as possible so that any potential issues can be found and fixed before the changes go live.